Hilton HHonors has a new promotion for staying at Conrad and Waldorf Astoria between January 23 and December 31, 2014. You will earn 2,000 bonus points PER night (nor per stay). The terms say that this offer would be targeted. You can access this offer on Hilton’s website here and make sure that your stay is eligible (access here). A LoyaltyLobby reader forwarded me the offer and I registered for it. The system accepted the registration. Hilton usually splits out a warning that you are not eligible for the promotion, if the registration is not successful. I tried to register again and just received the message that I was already registered for the offer. This is a nice promo for those that tend to stay at Conrad and Waldorf Astoria collection hotels. 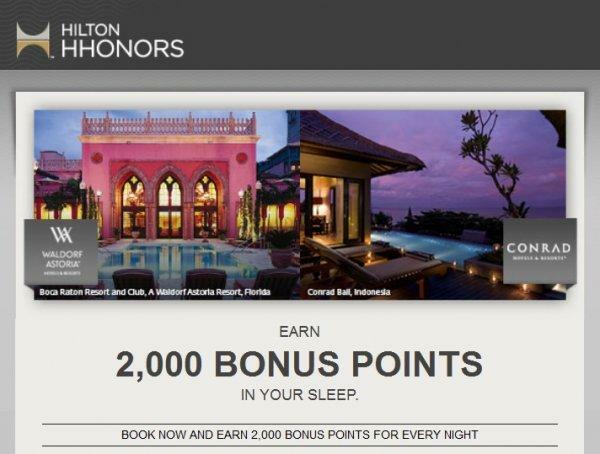 Hilton promotions that offer flat number of bonus points such as this tend to post for award stays as well. Offer is valid for recipient of this email only and is non-transferable. Offer valid for stays booked and completed between January 23, 2014, and December 31, 2014 (“Promotional Period”), at participating Waldorf Astoria Hotels & Resorts or Conrad Hotels & Resorts. Bonus Points earned on Base Points do not count toward Elite tier qualification. Please allow six to eight weeks from completion of your stay for points to appear in your Hilton HHonors™ account. Offer is not transferable and cannot be combined with other select offers.